I want to take this opportunity to thank you - our donors and sponsors - for your generous support of the Women's Heart Foundation as we seek to institute school-based wellness and prevention communities. These are difficult times for all of us, but especially for charities trying to do more with less. 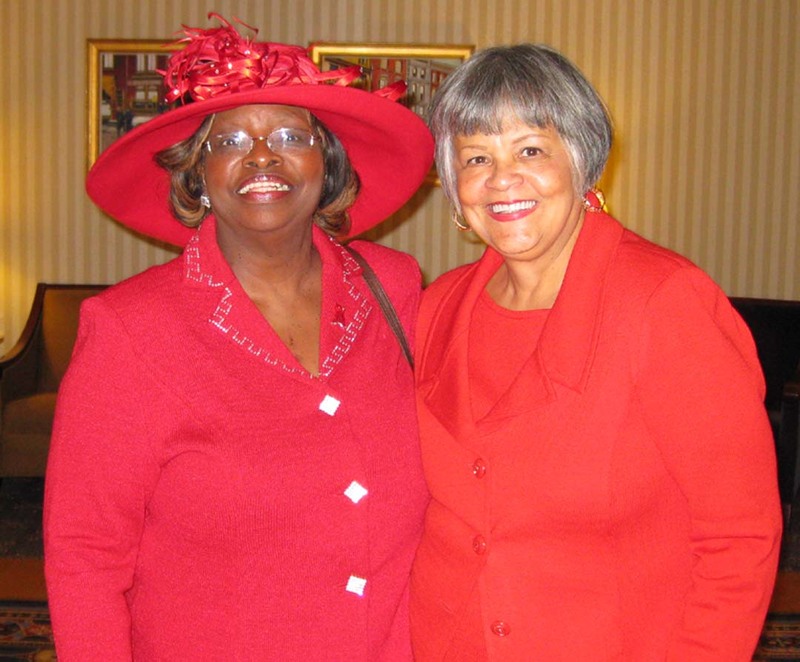 Since 1989, WHF has tirelessly advocated for women and heart disease awareness. In 1994, we began Women's Heart Week - a program that is now observed nationally. In 2004, we launched Teen Esteem Health and Fitness at Trenton High, representing the first public-private-nonprofit collaborative to provide a gym-alternative wellness program for vulnerable at-risk adolescent girls. With the great success of Teen Esteem at affecting healthy lifestyle choices, school officials have asked the WHF to create a similar program for younger-aged kids, including both boys and girls. We are calling this new initiative "The HeartFitKid Project" and hope to begin the design of the dedicated space in the middle school this spring so that classes may begin in the fall. We continue to administer the Teen Esteem program, and plan to launch an educational series for teachers and school nurses who wish to institute wellness and prevention programs in their own communities, but we need your help to reach this next milestone. Please consider a tax-deductible donation to the Women's Heart Foundation. Our future for becoming a healthier nation depends on it. Donate today. The College of New Jersey and WHF have teamed to offer Teen Esteem students at Trenton High one-on-one support for setting and reaching goals. "We're thrilled to be able to work with the Women's Heart Foundation and the Teen Esteem program in offering our nursing students this exciting clinical internship opportunity", said Dr. Philbin. "Motivational Interviewing promotes self-directed health behaviors and a new approach by nursing to help individuals achieve their personal goals." Pictured above: Nursing students from the TCNJ School of Nursing, Health and Exercise Science who participated in the Motivational Interviewing pilot, under the direction of associate professor Dr. Kathleen Philbin. This was the second year TCNJ piloted the program. Click on photo to view enlarged image. Gender Care and Treating Heart Rhythm Disturbances: WHF Reviews New Brochure on Radiofrequency Ablation The Agency for Healthcare Research and Quality (AHRQ) requested the WHF review a new brochure for Radiofrequency Ablation (RFA) last June and recently released the final version of this document. RFA is another way to put the heart back into normal rhythm. It stops the electrical signals that come from places other than the SA node. In RFA, thin wires are threaded into the heart through a vein in the arm or leg. One wire is used to find the problem areas in the heart's electrical system. Then heat is sent through another wire. The heat destroys a small amount of tissue in the problem areas and stops abnormal heart beats. Once all the problem areas are fixed, the wires are taken out. The RFA procedure can take 3 hours or more. The doctor moves the wires carefully between the heart's chambers. After the procedure is over, most people do not have much pain. You will need to stay lying down for a few hours, but you may be able to leave the hospital the same day. Some people need to stay at the hospital overnight or longer. Most people have RFA only one time. Click here for pdf of Adults' Guide to Radiofrequency Ablation. While this guide does not compare RFA to the freezing method of ablation (cryosurgery), it does make comparison to use of anti-arrhythmic drugs. Studies show anti-arrhythmic drugs are toxic to a woman's heart with a high rate of serious side effects including sudden death. The Women's Heart Foundation participated in a recent conference call with the U.S. Food and Drug Administration (FDA) by invitation to add comment to ways of increasing transparency per a directive by President Obama. Several incidents spurred concerns for how the public agency operates, including grossly unsanitary conditions at peanut butter manufacturing plants, deaths of celebrities related to use of prescription drugs and an untold number of heart attack deaths from Vioxx® (Generic: Rofecoxib), a non-steroidal anti-inflammatory drug manufactured by Merck and Co. and used to treat arthritis. There were delays in recalling the drug, and lawsuits are being filed as a consequence of this known hazard being prescribed and made available to the public for an extended period of time. The government will be increasing funding to the FDA so that more oversight can occur. Under scrutiny is how drugs receive approval by the FDA and the fact that there is a conflict of interest whereby the manufacturer of the drug must fund the testing and approval process. Dr. Kathleen Uhl will remain at the helm, providing the kind of information consumers need to make better health choices. Bonnie Arkus, WHF executive director, made a suggestion to provide more access to drug information sheets to include specific therapeutic effects, side effects, adverse reactions and synergistic reactions one should avoid. She said that the message that currently appears on over-the-counter (OTC) drug labels: "Contact your doctor should you experience any side effects or adverse reactions", is too ambiguous and not at all helpful to consumers. She asked the FDA to consider mandating complete drug information sheets be included as a package insert with all OTC drugs. She asked the FDA to provide all drug information sheets be available online through a dedicated website, much like the Physicians' Desk Reference, but with targeted information for consumers, thereby providing a valuable consumer service with greatly improved access to lifesaving information. "Consumers are looking for this type of information" she said. "We all need to know about synergistic effects that may occur when taking medicines. Whether medicines are purchased through prescription or OTC, they all have side-effects and adverse reactions that occur. This is a critical issue, especially for women", she said. Ms. Arkus said this type of medication information is difficult to find on the web. She said that having ready access to drug information will provide consumers with the knowledge they need to make informed choices about their health. The telephone conference was taped and is being made available to the public on the FDA website. The Women's Heart Foundation was chosen for the 5th consecutive year to receive a $15,000 grant from the Horizon Foundation for New Jersey to continue its Teen Esteem Health and Fitness program. WHF co-administers the intervention project attending to 120 vulnerable adolescent girls who are at-risk for obesity, early heart disease and dropping out of school. The Teen Esteem program is a comprehensive gym-alternative that specifically responds to teen girl health. The program entered its 6th year this past September and has consistently resulted in participants making better health choices and remaining in school to graduate. The Horizon Foundation for New Jersey is dedicated to supporting charitable organizations making an impact in the lives of people across New Jersey. Women's Heart Foundation is on ShesConnected.com open discussion groups on women's heart disease. Volunteer Corner The New Jersey State Federation of Women's Clubs has earned this rightful recognition in our Volunteer Corner. 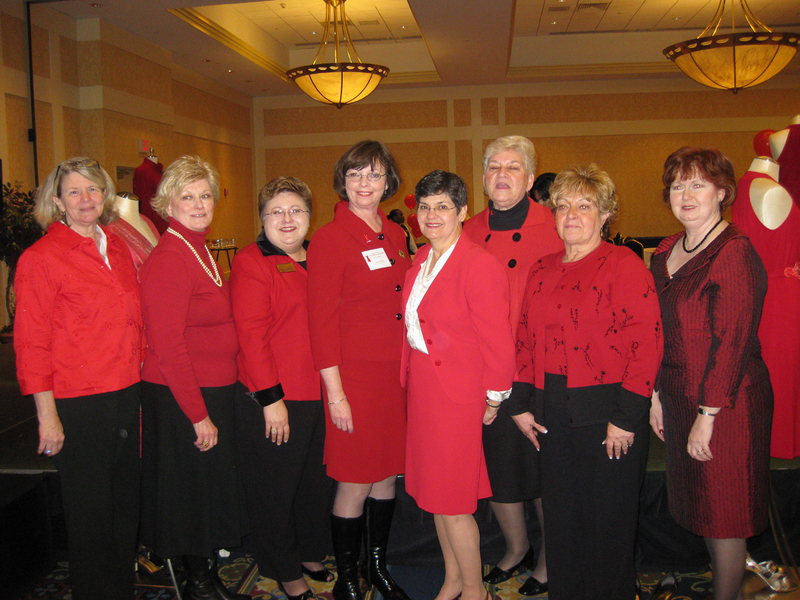 Pictured below is NJSFWC President Anne Redlus (center) flanked by proud club members who attended the Women's Heart Luncheon 2009. The Club has placed its full support behind the Women's Heart Foundation's mission to establish school-based wellness and prevention programs and will be assisting in marketing the Women's Heart Red Dress Luncheon 2010, the 6th Annual Run for Mom on Mother's Day and the official launch of the HeartFitKid project. Membership in the New Jersey State Federation of Women's Clubs of GFWC consists of Women's Clubs, Evening Membership Departments, Junior Clubs and Juniorette Clubs. There are 203 Woman's Clubs, 46 Junior Woman's Clubs and 10 Juniorette Clubs spread across the state of New Jersey. Each club is autonomous and sets their own membership requirements.